Petra Village is an all-inclusive traditional 3-star resort located in Koutouloufari, a rustic village where you can enjoy a laidback vibe. For guests looking forward to having fun outdoors, the nightlife of Hersoniso and its beautiful harbor awaits them a short drive away. 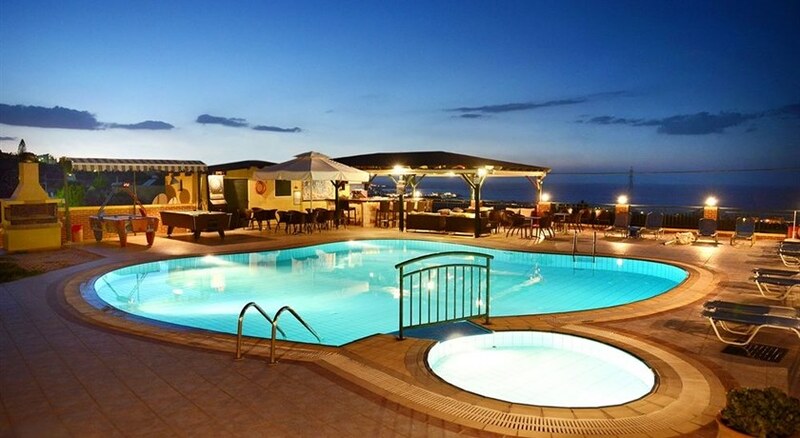 Featuring a lovely swimming pool with sun beds, snack bar and great seaside views from this strategically located hotel, look forward to enjoy a relaxed and comfortable stay characterized with warm, traditional Greek hospitality. The studios and guestrooms are tastefully furnished in contemporary décor and offer amenities like air-conditioning, a telephone, satellite TV, safe and a hairdryer. The hotel is located just 2.5km from the beach. Koutouloufari is a rustic and picturesque village nestled on a hill above Hersonissos offering amazing views of a broad bay and the harbour. There are plenty of local shops and tavernas which are typically Cretan in nature. Visitors to Koutouloufari have an array of beaches to choose from. The closest is less than 2km downhill. Beaches here offer some of the best water sports facilities in Crete. Moving west there are larger and less crowded stretches of excellent beach. Koutouloufari nightlife is rather subdued, with drinking and dining at one of the many quieter tavernas and chatting with locals. Better options are available at Hersoniso, at around 5 kilometres from the hotel. The Petra Village hotel is located on the outskirts of the peaceful village of Koutouloufari just about 3km from the beautiful Hersoniso harbor. The sizzling nightlife of Hersoniso is reachable with a short stroll. The lovely beach is just 2.5km away. 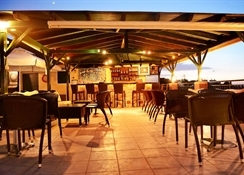 The hotel is 23km from Heraklion Airport and 165km from Chania Airport. The Petra Village complex has well-furnished studios, duplexes, maisonettes and one bedroom apartments. The rooms are spread over six blocks which sport traditional design but come equipped with all modern fixtures and amenities. The immaculate guestrooms come with a private balcony and offer magnificent views of the seaside or the pool. The tastefully furnished rooms come with air conditioning, a telephone, satellite TV, safe and a hairdryer. There is a furnished kitchenette with an oven, a kettle, electric cooking rings, a toaster and a fridge. Guests may have to pay for some amenities locally. The Petra Village complex is meant to be self-catering with a furnished kitchen with an oven, a kettle, electric cooking rings, toaster and a fridge. Guests can easily get their groceries nearby and cook their own food. The hotel also has an onsite bar serving drinks and snacks throughout the day. There are a number of bars and restaurants serving Authentic Greek as well as international cuisine. The hotel has a lovely swimming pool surrounded by free sun beds and a poolside snack bar. Kids can have a lot of fun at the Kid’s Pool. Guests can enjoy a leisurely stroll at the garden or soak up all the sun at the beach about 2.5km away. 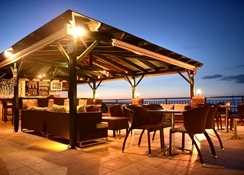 The hotel organizes sizzling BBQ nights with traditional dancers and the hotel desk can guide you to local excursions. 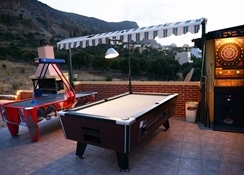 There is a pool table and facilities for golf. Car and motorbike rentals are available. we went may 2016, the facilities, although a little dated, were ample for our needs, fridge, microwave and a cooker in the kitchen and all utensils. the beds were fine and everything worked as it should, the staff, aprticularly giannis and vaso, were amazing, they couldnt do enough for us. everything was clean and the onsite cleaner worked her socks off. overall a great holiday.